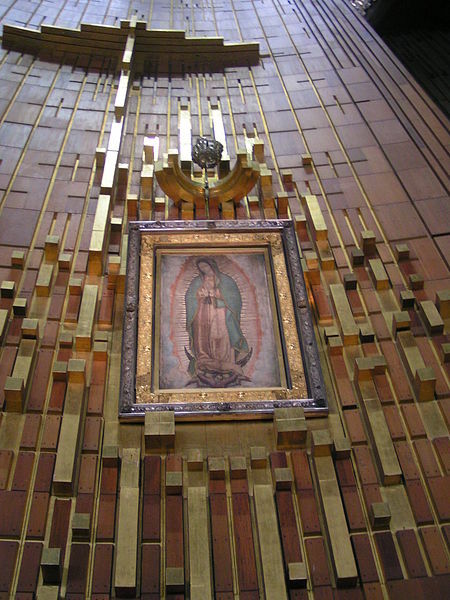 On December 12 we celebrate the Feast of Our Lady of Guadalupe with a Bi-lingual Mass and Fiesta. 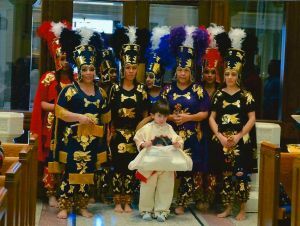 The celebration includes Aztec Dancers, a Mariachi Band, and authentic Mexican Food. December 12 is the anniversary of the consecration of the church in 1909, and is one of the special days for pilgrimages at the Basilica. Visitors to the Basilica on this day may receive a Plenary Indulgence. All are welcome for this special celebration! La Comunidad Hispana de la Basílica de la Asunción de Santa María, les invita a la Celebración de Nuestra Señora de Guadalupe. In 1531 the Blessed Virgin Mary appeared to a poor Aztec Indian named Juan Diego. This encounter not only changed his life, but the life of an entire nation, as well as countless millions of people down through the centuries. The Spanish missionaries, who had accompanied the conquistadors, labored for decades to bring the Gospel Message to the native people, but had made few inroads. In an incredible turn of events, the Mother of God herself came as the special messenger of God’s love and mercy. Appearing to Juan Diego, a convert to the faith, she asked that a church be built in her honor. Upon seeing the image of Our Lady, the Aztec people entered the Catholic Church in astounding numbers approximately six million converted in the span of six years!